making it happy and contented with life. We live in a society of more, better, faster, fame. There is an idea that happiness is just around the corner, if we work hard enough. But on my recent family vacation I met a taxi driver who had that glow. Not famous, not rich, but so happy and content in his life. He had been married for several decades, and moved to Maui with his wife in the 80's after they fell in love with the island during a vacation stay. We agreed that one of the great benefits of age is learning to recognize what truly makes you happy and building your life around that internal compass, instead of following some ideal of "success." For me, I have found so much joy in being an artsy mama. I get to play, I get to laugh, and best of all I get lots and lots of hugs. After years of playing on stage, trying to "make it" in the music industry, I find that happiness is as simple as my son's smile and a good stash of art supplies. 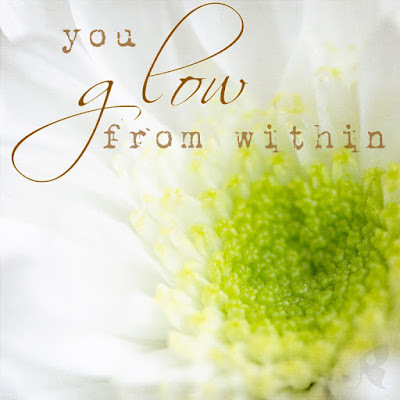 What makes you glow? Has it changed over time, or has it always been there, waiting for you? P.S. It's Texture Tuesday again at the Kim Klassen Cafe. This week's theme is white, so follow the link for more glowing images! Awww what a wonderful, wonderful story! I think we should all be able to grow happier the older we get. If that were only true. I love the photo too. Out of the corner of my eye, I swear I saw it move a couple of times. As for me, what makes me glow? I'm not 100% sure I have found it yet. I know art and photography and most of all my family are things that make me happiest. I love your story, totally agree about the importance of "glow"... And a lovely image! lovely image and message. Something for us all to think on. That is a beautiful story! Your image is gorgeous, I need that in poster size! Staying home and being creative makes me glow! I popped in from Texture Tuesday, so happy I did...I'm going to think about glowing all day! What a great story, and I love your image.